Firstly, you can only obtain Nepalese Rupees when there, you will not get any until then. Most Hotels will take the £GBP but it's harder to pay for anything else, it's easier with $US. The reason for this, as far as I can see, is that at present anyway, one dollar exchanges for 100 Rupees so much easier for anyone to calculate. However, again, at present the £GBP is very strong. You can exchange into Rupees as soon as you arrive at Kathmandu Airport but not until after you've been through the Visa and Custom process. If you are not changing money at the Airport, best take dollars. It is also wise to have some one dollar notes if possible. Should you have a Taxi awaiting you, they will usually give your name to an Airport Porter to hold up upon leaving the Terminal and they will carry your baggage to the Cab. One dollar would be more than a sufficient tip. 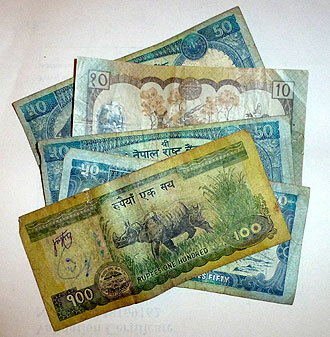 There are no Coins in the Nepalese Currency, it's all notes from 5 Rupees up to 10,000 Rupees. 10,000 Rupees is quite a substantial sum in Nepal (£62 at time of writing). For many workers this is equivalent to a month's pay. A meal of main course, desert and a Coffee in a pretty good establishment will cost around 800 Rupees (£5), but this could be easily beaten. My Taxi Driver had a Curry from a Street Stall on the way to Chitwan and paid 75 Rupees ((46p!!). Bottled Water is very cheap at about 15 Rupees (9p) a litre. So if you don't stand to lose too much exchanging GBP for Dollars in this Country, take Dollars. If you take GBP, best to exchange at a Bank in Kathmandu. There are many ATM's around the City and as long as you've told your Bank before leaving home that you're going to Nepal, you'll have no problem drawing Money out. Every ATM I saw had a Security person standing close by. 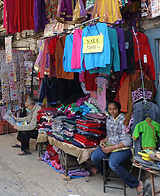 If you're venturing off the beaten track, take Rupees every time. The above are based upon October 2013.